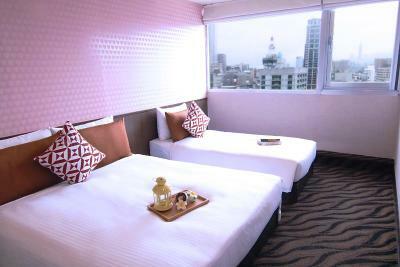 Lock in a great price for Diary of Taipei Hotel - Wanguo Branch – rated 8.3 by recent guests! 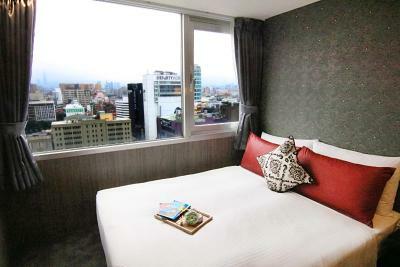 The hotel is right smack in the middle of Ximending, the Myeongdong of Taipei. 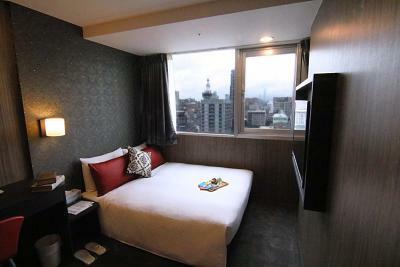 The room goven to us have a wondow overlooking the city, which is a pleasant addition. 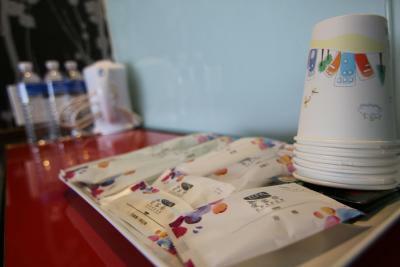 Rooms were provided with adequate supplies like water and toiletries. However, the hotel doesnt offer breakfast, but has free coffee and water near the reception area. This may not be a huge problem for there are lots of local reataurants offering authentic Taiwanese cuisine. Should you be averse to local food,there are also Western restaurants/establishments at every corner. The hotel is near everything! Great location! The room is so comfortable! The location was great! 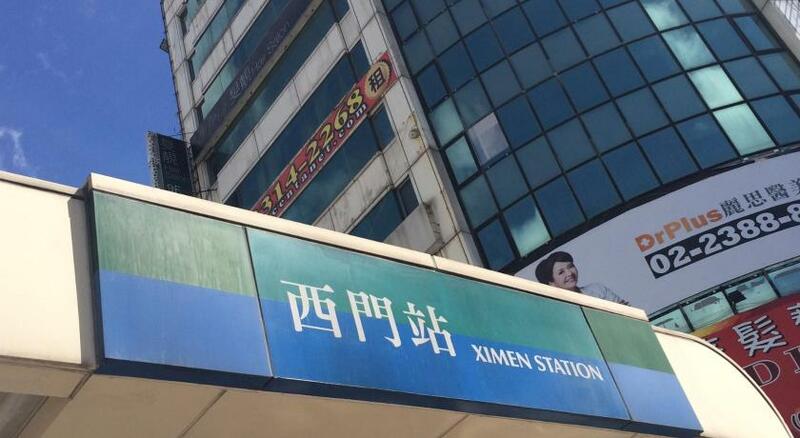 Very convenience to travel around, just walk a little from Ximen station. Got a family room. Walking space in the room was limited. Excellent location. Toilet was clean. Been coming back to this hotel for years now. It feels like second home already. Nothing beats the location of the property. Best location . Just on top of Ximeng ting shopping street. Can shop until midnight. In the heart of XiMenDing, just about 200m away from MRT exit 6. We were given an upgrade of room from 2 single beds to 2 double beds and the front desk receptionist was very friendly and check in was smooth and fast. Location of the hotel is also good as is easy to find (just above Uniqlo and the cinema) and is in the centre of Ximending shopping district. To take exit 6 from Ximen MRT station. 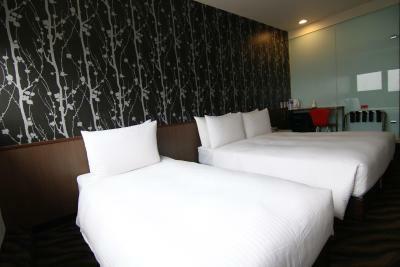 Good location near to MRT, surrounding with food stalls. The location is superb! Very near the MRT! Looks like the shopping districts of Japan right at the hotel's doorsteps! 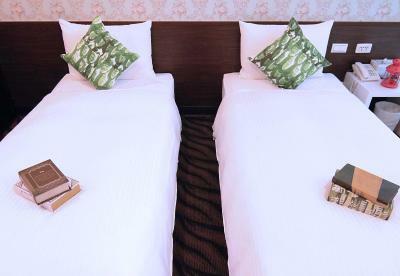 Diary of Taipei Hotel - Wanguo Branch This rating is a reflection of how the property compares to the industry standard when it comes to price, facilities and services available. It's based on a self-evaluation by the property. Use this rating to help choose your stay! Located just a 5-minute walk from Ximen MRT Station, Diary of Taipei Hotel - Wanguo Branch provides easy access to the city’s attractions. 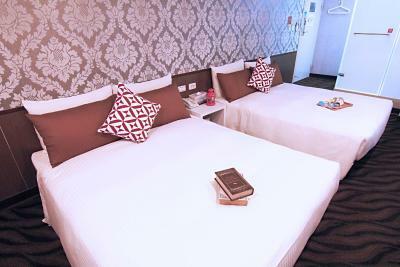 The hotel offers elegant rooms equipped with private bathroom facilities and free WiFi. It takes 50 minutes by car from the hotel to Taiwan Taoyuan International Airport and 20 minutes to Shilin Night Market. Chiang Kai-shek Memorial Hall is a 13-minute drive away, while the Red House is a 5-minute walk away. Taipei High Speed Rail is 1 metro stop away. The hotel is located next to Uniqlo and above the cinema. 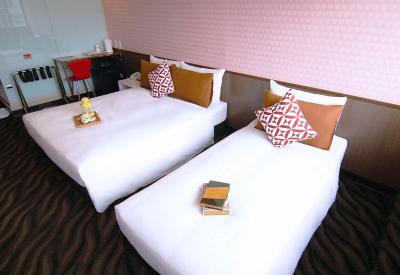 The rooms at Diary of Taipei Hotel - Wanguo Branch feature a sleek décor and come equipped with a flat-screen cable TV, an electric kettle and a writing desk. 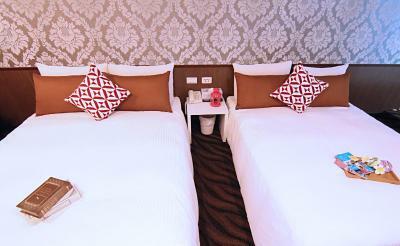 Room slippers and free toiletries are provided for guests’ convenience. For meals, there are many convenience stores and restaurants located around the hotel. 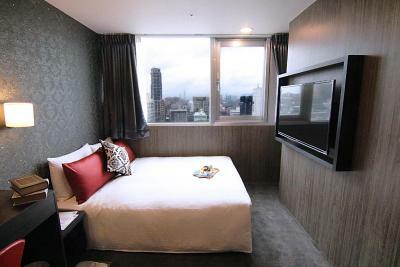 When would you like to stay at Diary of Taipei Hotel - Wanguo Branch? This quadruple room features a private entrance, air conditioning and electric kettle. Some of this room type might not have windows. 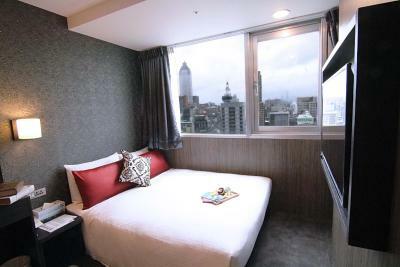 Guests can see the Taipei 101 in the room. Hotel surroundings – This neighborhood is a great choice for travelers interested in shopping, night markets and street food – Check location Excellent location – show map Guests loved walking around the neighborhood! House Rules Diary of Taipei Hotel - Wanguo Branch takes special requests – add in the next step! Diary of Taipei Hotel - Wanguo Branch accepts these cards and reserves the right to temporarily hold an amount prior to arrival. 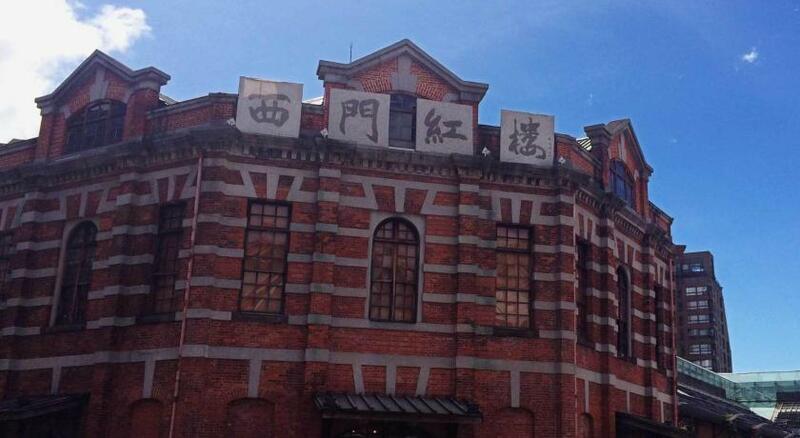 Please inform Diary of Taipei Hotel - Wanguo Branch of your expected arrival time in advance. You can use the Special Requests box when booking, or contact the property directly using the contact details in your confirmation. Cannot throw paper into toilet bowl...no direct lift service to level 13...need to climb 1 level as e lift take some time to come up. The hotel is above a theater, restaurants and Uniqlo store, so one can expect to share the elevator with theater-goers and diners. At times,most especially at night, there is a long queue for thw elevator. Can consider having a private hotel lift rather sharing the whole building lift which sometime result in longer time spent on stopping on every floor. If stopping at every floor doesn't affect u that much, it's a great location anyway. The staffs have been a great help in most aspects. If only they allowed us to check in a little early with extra cost because we came from an early morning flight but over all the place is great! I thought getting a room with window is better. But the window is along the corridor. Excellent location right in the heart of Ximending and conveniently walking distance from Ximen station exit 6! The hotel is clean and easy to find as well! The room was looking a little tired, and was quite cold at times (we were visiting in February). As the hotel is above a cinema at times we could hear residual noise from it, but this didn’t disturb us during the night so wasn’t too much of an issue. 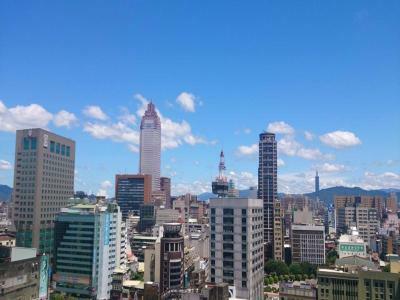 This hotel is in a great location, right in the middle of the Xinmendimg area of Taipei, and 2 minutes walk from Ximen MRT, from which it is super easy to get all over Taipei. 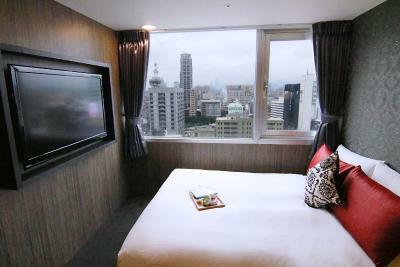 The staff were helpful, and although basic, the room was good value for money and had a great view of Taipei and the surrounding mountains. The sound proof is not that strong as there was 1 midnight, I guess there is late check-in travelers but they are kinda inconsiderate as I keep hearing door closing that gave a loud bang for more than 10 times. If only the staff can warn the people about the noise at such wee hour. Other than that, everything is great. This is actually my 2nd time staying at the same branch. I like the location as it is convenient regardless for entertainment / shopping / transport / food. I dont mind to choose this branch again for my next visit. I again like to thank Debbie, Eve and Dada for being so warm when we had stayed for the 2nd Time in their establishment. It felt like our 2nd home already. Thank you ever so much indeed darlings and see you again soon!